摘要 目的：探讨青年乳腺癌的临床病理特征、分子分型及预后情况。方法：收集天津医科大学肿瘤医院2002年1月至2009年12月经手术切除、病理证实的133例年龄≤30岁低龄青年乳腺癌病例，及同期117例年龄为31～35岁青年乳腺癌病例，并随机抽取同期年龄＆gt;35岁的中老年乳腺癌214例作为对照，回顾性分析其临床病理资料、分子分型及预后情况。结果：低龄青年乳腺癌、31～35岁青年乳腺癌与中老年乳腺癌在肿瘤大小、淋巴结转移、组织学分级、分子分型和肿瘤复发方面差异有统计学意义（P〈0.05）。低龄青年乳腺癌更易出现三阴性乳腺癌、复发及远处转移（P〈0.001），并且低龄青年乳腺癌与31～35岁青年乳腺癌、中老年乳腺癌相比，有较低的总生存率和无病生存率（P〈0.05）。结论：年龄≤35岁青年乳腺癌症状隐匿，预后不佳，与中老年乳腺癌有不同的临床病理特征、分子分型及预后，应重视早期筛查与治疗。 Objective：To study the clinico-pathologic characteristics, molecular phenotypes, and prognosis of young breast can-cer patients. Methods：Data from 133 low-age （age≤30 years） young breast cancer patients and 117 young （31 years≤age≤35 years） breast cancer patients who underwent surgery between January 2002 and December 2009 were reviewed. Cases of the middle and old-age elderly （age＆gt;35 years） breast cancer patients during the corresponding period were randomly selected as matched controls. 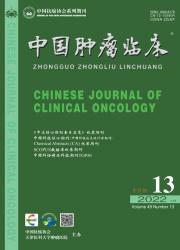 The clinico-pathologic characteristics, molecular phenotypes, and prognosis were retrospectively analyzed. Results：The low-age young and young breast cancer patients significantly differed from the elderly patients in terms of tumor size, lymph node metastasis, histological grading, molecular phenotype, and relapse （P〈0.05）. The low-age young patients are more vulnerable to have triple-negative breast can-cer, recurrence, and distant metastasis （P〈0.001）. Moreover, the low-age young patients have lower overall survival and disease-free survival than the other groups （P〈0.05）. Conclusion：Young breast cancer patients have poor prognosis compared with the elderly. Ear-ly screening and prompt treatment are necessary for young breast cancer patients.